All profiles on Facebook have tabs. For example, users have a 'Photos' tab and a 'Links' tab by default. StackEngine is an application for Facebook to embed reputation, earned badges, etc. 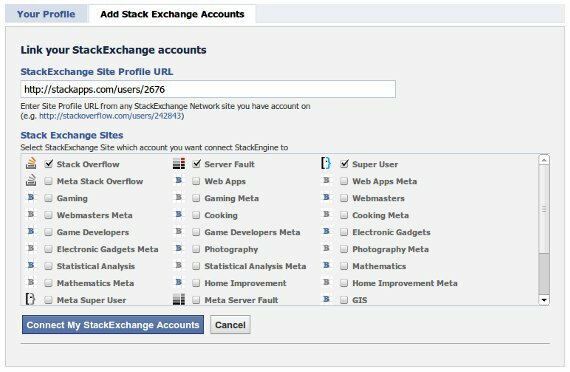 from user Stack Exchange Accounts to StackEngine application tab on user profile. 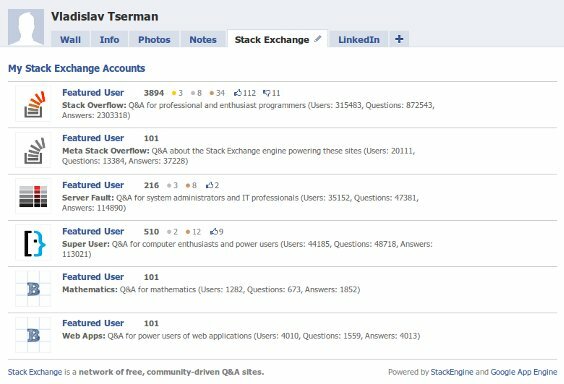 Your friend can check out the StackEngine profile tab to know what you’re doing on Stack Exchange, and the friend can click back to your canvas page. Let friends know your flair. Leave your feedback and bug reports on 'Reviews' tab on application profile on facebook. I'm working on adding new features. Any suggestions for improvements/features to add? Is it worth to add the ability for application to post to a user's stream whenever user ask/answer/comment/favorites question, awarded badges, etc. on Stack Exchange sites connected to Facebook via application? One major drawback is that to support such feature Extended Publishing Permissions ( publish_stream, offline_access) will be required. Browse other questions tagged app facebook .